PAINTERS LINT FREE WIPES • "POLYSOFT WIPES"
Painting and wiping go hand in hand, but what makes all the difference is if the wiping cloth is lint free, and not going to leave behind remnant pieces of lint from the cloth after use! This requirement is true for all painters...artists and contract painters alike. POLYSOFT 100% polyester lint-free painting cloths are perfect for delicate painting tasks where it is imperative no lint or loose fibers are left behind on the canvas or painting surface. These lint-free canvass cleaning wipes are double knitted and laser cut to ensure no fiber escapes from the cloth to ruin the paint job. POLYSOFT paint wipes are also super soft and non-abrasive so will not damage artwork or painting surfaces. They are also handy to clean and wipe down paintbrushes, hands and other equipment. They can be used with chemicals making them perfect for after paint cleanup and also correcting unwanted brush strokes off surfaces using a chemical cleaner with the wiper. Available in portable packs of 150 painting consumables cloths (22cm x 22cm), they can be carried around and conveniently pulled out as required. 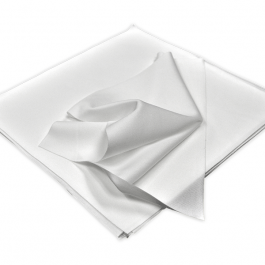 A versatile cloth, that is absorbent and durable making it suitable to multiple uses. So next time you are looking for a lint-free cloth for those delicate painting surfaces, use a speciality cloth like the POLYSOFT lint-free paint wipes, for a professional finish! Other related products from TIDDOX 's range of painting cleaning cloths include the LOW LINT INDUSTRO WIPES. , the SOLVENT RESISTANT WIPES, and the PAINTERS WHITE WIPES-ON-A-ROLL.